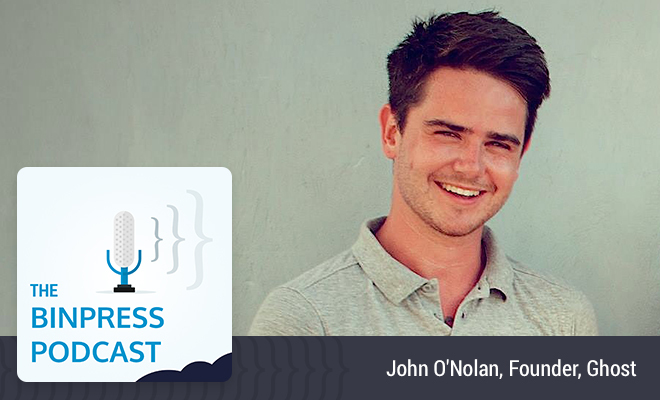 On episode three of the Binpress podcast we talk with John O’Nolan, co-founder of Ghost, the open-source blogging platform that took Kickstarter by storm. We cover what the GPL has in common with a certain religion, why long-form blogging is seeing a resurgence, how many registered users Ghost has and how much revenue they generate. Of course, John also chats about what goes into an incredibly successful Kickstarter campaign, what’s required for sustainable open source and how they (passively and actively) avoid making Ghost a general-purpose CMS like WordPress. What’s the secret to a wildly successful Kickstarter campaign? Years of work. As is usually the case, what seems like an overnight success required far more time and effort than what casual observers may think. For John, this meant years of experience working with the WordPress UI team, months of research, a large network of contacts and much more. Being a non-profit organization doesn’t mean you’re a non-revenue outfit. Ghost, a non-profit itself, makes money from its premium hosting services and pays its employees salaries. Being a non-profit helps ensure that you stick to your original vision since money isn’t a monolithic decision-making factor, and there are no shareholders dictating your goals. The newsroom is ripe for having things shaken up. Newspapers (and their online presences) often use archaic tools and workflows. If there’s a publishing software challenge to be tackled, it’s this. Alexis: Well thanks, John, for joining us. Alexis: Not a problem. Tell us a bit about yourself. John: You’ve said the most important bits, I think. My name’s John and about a year ago I founded a new blogging platform called Ghost. The idea of it is to be a very simple, very focused publishing platform using very modern technology. That’s what I enjoy. I like technology, I like publishing platforms, and I like pushing the boundaries. So that’s why I’m here, I guess. Alexis: Now, we’ll get to pushing the boundaries a bit more later when we talk about your kite boarding. Alexis: You’re not just coming into a blogging platform out of the blue. You’ve had some experience with WordPress. John: Definitely, yes. I think quite a lot of people have tried to create blogging platforms out of the blue. Sometimes it goes well and sometimes it doesn’t. For me, it’s been more of a kind of not necessarily life-long, but career-long path to work on publishing platforms and on blogs, specifically. I started freelancing like many people do about eight or nine years ago now, I guess. Since then, my work through one way or another has always been on building blogs for people, building blogs for myself, sometimes corporate blogs, startup blogs, sometimes magazines, travel publications, a whole range of different things, but almost all of them kind of relate it or directly in some way blogs or blogging platforms. Through doing that kind of work a lot, I eventually started contributing as an open-source contributor to the WordPress design team. It’s about for a couple of years to the point where I was the Deputy Head of their design team. So I got pretty intimately familiar with what it was like designing a publishing platform, blogging platform for users. A lot of that freelance work as well as the open source contribution work led to the ideas and a lot of the inspiration behind Ghost. Alexis: The impetus for Ghost was essentially that WordPress is becoming an octopus, essentially, that can mask itself and do everything rather than just being a blog. John: Exactly. Yes, which is incredibly exciting and I think they’re going in a really, really cool direction. It’s starting to get really interesting too. People are building with WordPress. It’s like the stuff that’s coming out of there now in terms of the e-commerce out of things, in terms of the mobile application space. It’s getting crazy. I never would’ve imagined what WordPress could do all that stuff, but at the same time it’s starting to leave this kind of void of tools that had focused purely on publishing. Publishing is experiencing its kind of 2014 renaissance at the moment with platforms like Medium and Subtle are all dropping into the fray, and people getting more passionate again about having longer-form written content. Where WordPress is right now is in a slightly different place than where it was 10 years ago, certainly. Alexis: Now ironically, years ago when I, ran a video game news blog, I started out with Joomla. I thought this is going to give me the most flexibility because I don’t know what I’m going to need. It can be everything and anything. After a while I thought, “Well. This isn’t working out. I need something that’s just focused on blogging.” And then I went to WordPress. Now today, ­I guess I would’ve gone with Ghost. Alexis: So speaking of the renaissance that blogging is seeing. I mean two or three years ago… “You still write on own blog? That’s funny. Why don’t you just use Twitter or Facebook or Google Plus or something?” Why do you think that’s happening? John: I think there’s a lot of reasons. You can’t necessarily pin it down to one thing like people are over Twitter or social media has just passed its hay day. I think there’s always new formats that are coming along, or old formats presenting new ways, which is where you could arguably say a medium is. They get people excited and doing things again, and at the same time just like you see the cyclical trend in design trends going from flat to glossy, to flat to glossy, to minimalist to glossy again. You see the same kind of thing in COTSon as well. With people wanting to have curated summaries of everything to wanting to get really in-depth long-form pieces. To some extent, a case of history will be repeating itself. I think to another extent a case of the tools both for reading and writing and proving and hopping between the two in terms of what’s the most pleasurable to consume. Alexis: Now, obviously besides Ghost, do you think other things are going to stick around that have popped up recently out of that? John: I don’t know. I guess we’ll have to see. I think there’s a lot of people experimenting with some really interesting ideas to claim the content creation space. You’ve got tools like Draft. Unfortunately until recently and editorially, it was also looking really good. I think there’s going to be a lot of people vying and pushing each other to create some interesting tools in this space. Alexis: Before we go a bit deeper into Ghost, I have to ask. What’s in the name? John: It’s funny. Quite a lot of people ask that. It’s a combination of things. On the one hand, it’s this idea that Ghost is your ghostwriter or ghost publisher. It gets out of your way. It just sort of blends into the background and you use it. So you focus on the writing, and it gets out of the way, and handles all the background tasks of creating a blog and publishing the content and doing all the technical side of things. On the other side of it, I had a conversation with my dad once some years ago. He was telling me, because he knew I was working or contributing to work most of the time. He was telling me about how these bloggers in Cuba were using WordPress to ghostwrite their own lives because they had such political oppression. They could never be discovered writing about their own government for fear of imprisonment or serious bodily harm. So they were using WordPress to kind of smuggle blog posts about their own lives out of the country and written under fake names. But for tremendous political and social value that has a real impact on changing the world, changing society doing something really important, and that idea of kind of the modern ghostwriter, that using technology to impact society resonated very strongly with me. Those two things just seem to match up in a nice way. I thought it was quite catchy, so I wrote it down and it kind of stuck. Alexis: Well you’ve given me a new startup idea. I’m going to start a new blogging platform called Smuggle, only for bloggers in exile. Alexis: All right. You guys have open-source Ghost from the very beginning under MIT license. Alexis: Was that your personal investment in open source? What was your reasoning behind that? John: It was a combination of things. So WordPress, I come from very much a GPL background, which is what WordPress is. WordPress is GPL 2. It inherited that from B2, which is WordPress’ a fork of a platform that came before it called B2. So it didn’t inherit its license from them. That was never a conscious decision to go with that license, but that’s what they’ve ended up with. It has a lot of strengths, but is also has some things that I’m not a huge fan of. I think open source licenses, when it comes down to it, are a lot like religions. Everyone has a favorite one, everyone has the one they believe in, and everyone thinks that anyone else’s is wrong. A lot of the time, the kind of religious debates that revolve around open source licensing. Involve people knocking on each other’s doors at 8am trying to convince other people to inherit their beliefs. That’s how I kind of how I feel about the GPL. I feel like it’s a Jehovah’s Witness. You can do anything with me as long as you believe all the same things I believe, and that’s this kind of viral nature of passing on its own license. Like if you build anything with a GPL licensed products, then your thing that you built also has to be GPL. John: That’s this concept of Copyleft. For some people, that’s an incredibly important concept of forcing the spread of open source. I see where they’re coming from. I see how that works, but for me I think a far more powerful idea is giving people the choice. You take this, and sell it, or make it close source, or do whatever you want with it, but we’re giving it to you for free. You also have the option to give this to other people for free. This is why we believe that’s important, and now it’s your choice to decide what to do. I think if you tell people what to do and you offered people the choice of what to do for themselves, ultimately you’re going to produce a better result because the people who don’t want to do the thing aren’t going to do it. And the people who do want to do it will appreciate having the choice to make themselves. Alexis: So not only is Ghost open source, but you guys are non-profit as well? John: Yes. We wanted to get undistributed. We wanted to get the trifecta. Alexis: Going in as a non-profit, did you ever consider this was a product that you could support yourself and a team of folks with fulltime? John: Definitely. I think there’s a super common misconception that non-profit means non-revenue. That’s definitely not the case. So we are a non-profit company, and that’s still very much a company. We sell pro-hosting services for the Ghost platform. We make money from those services. We pay ourselves salaries, and those salaries go into supporting more development of the open source product, as well as the open source organization. The main difference and the philosophical difference, which is why we choice to be a non-profit, is that there are no shareholders dictating what’s happening, what the goals of the company are. And there’s no motivation because nobody owns any shares in the company, there’s no possibility to sell it to anyone. That means there’s no motivation to grow out only a set of features, which would generate money or to build only certain things because they will give is profits, which we can take out of the company at the end of the year. For me, it’s the open source equivalent of a company structure. It’s the most transparent, most obvious, most open where you can do business and say these are the reasons we’re doing it. There’s no way to question that. There aren’t any ulterior motives. John: Kind of. Maybe. I think what I see about the non-profit angle is that it takes a lot of like you said; it’s kind of like a firewall. It takes away some of those decisions. We’ve had, more than I can count, VCs, at this point send us an email saying, “You’ve popped up on our of radar of startups suddenly getting interesting, and we’d like to talk.” I reply saying, “You realize we’re non-profit, right?” They usually come back with “Oh.” Of course, they didn’t bother to research beyond the first paragraph. John: For me, that’s pretty easy. I don’t have to spend time thinking about that, or wondering about that, or thinking, or comparing how Ghost should make decisions to how other companies with a profit-centric model might do it. It’s just that’s not an option. Now let’s get on with building a publishing platform. Alexis: So a year later, and now Ghost has 160,000-registered users as of April, I believe. Ghost Pro now has 2,300 subscribers and now just over $175,000 in annual revenue. How has that matched with your expectations? John: Those are the numbers after four months, I think. We’re about — we’re a bit further down the line now. John: We launched Ghost Pro in January. It’s now, what are we, July or almost August? John: God, this year’s going fast. John: No. It’s been good. The first few months after launch and now it’s absolutely massive, massive numbers. Trying to keep up with the demand was a headache and a challenge all in one. Now it’s come down to a more manageable level where we’re just starting to figure out where the average level of growth for the company is. Then start to build up both the community, the company, and our product itself. From the launch numbers, we are absolutely thrilled and blown away that it’s resonating so strongly with people. Now it focuses very strongly on keeping that up. Making sure we keep delivering on the vision that we’ve been talking about this whole time. John: Initially, we went for a super… I should say a really conservative pricing structure, which kept all our plans pretty limited with a pretty baseline value for money level, should we say. The main reason for that was that we built our hardware infrastructure for actually hosting the entire network from scratch. So we didn’t have any data on how much it was going to cost us on how easily or quickly it was going to scale. We initially, because no one’s ever really built a cluster of node applications and Node.js applications that will scale like this. Didn’t even know how many blogs we were going to be able to fit on one server. When you have that many variables and unknowns, it’s pretty hard to even start to estimate where you should begin with your pricing. We’ve kind of had this Pro situation, which has been conservative. We’re now starting to think about what makes the situation on plans on Pro are going to look like. Based on user feedback, we’ve done some surveys and we’ve also figured out what for example how many blogs are we going to fit on a server, amongst other things. Alexis: What’s the answer? How many blogs can you fit on a server? Alexis: Okay. Let see. So you’re not currently making any money from the marketplace. It’s just a way for folks to discover different templates and that kind of thing? John: Correct. Yes. The marketplace is a longer-term project. It’s one we’ve barely, barely, barely gotten into yet. Right now, it’s pretty much just a showcase gallery. But in the future, I’m hoping it’s going to be much more of an app store like experience. Alexis: Okay. So there is a plan to maybe make, I guess, 20 percent off the top or something? Is that on the table? John: That’s the plan, yes. So we will take nothing from themes and plugins or apps rather, which are free. It takes more percentage of premium products, which goes to the marketplace. Alexis: Okay. So how many people are on the Ghost team? John: Right now, we have five fulltime. John: We’re definitely hustling. We’re definitely hustling, but now it’s good. We’ve reached break even, just about, which is a massive milestone as a company, as a business, as a startup, as anything. To reach that point at all is significant because it ensures the survival of what we’re doing. So now we’re hustling to actually continue to grow and find, I think, the more overarching point of product market fit where we start to see a more hockey stick type of growth, where we start to be able to really have more recurring revenue to reinvest in some of the projects and assets of the company itself and have a bit more flexibility to play with. Right now, we’re still very, very, very lean with everything we do. Spending the minimum and everyone doing about five jobs each. Alexis: Speaking of growth, where do you notice users coming from the most often? What’s their kind of profile? Do they drop WordPress and go to Ghost? John: At the minute, it’s definitely very much your stereotypical earlier adopter audience. We have a lot of tech entrepreneurs. We have a lot of people who are just interested in trying out anything. We have a bunch of writers who are looking for good tools, who are just kind of experimenting. And we have a lot of open source enthusiasts who really appreciate the business model and the development model of what Ghost is doing and want to support that for those reasons. What we see mainly is word of mouth. It’s how people discover us. People talking about the platform and all the reasons why it’s good. For the time being, that’s fine. We haven’t really gone after any big time consumer growth strategies yet. We’re still building up our main feature set. We’ve only just, as of like a week ago, finished rewriting our JSON API to have a solid foundation to develop on for the next set of features. We’ve been doing so much low-level foundational work for the first half of 2014 that we’re really just finding our feet. Alexis: Now I know you guys probably don’t do paid support or customization where a company can come up to you and say, “Hey guys. We’d love to have our own custom Ghost installation, maybe with these kinds of features. Can you build it for us?” Is that in the roadmap? Have you seen any other companies or web development shops that have just begun to provide that service? John: Definitely. Yes. There’s been quite a few that have started popping up. I think that’s what excited me from the point of view of creating a platform is the possibility of creating an ecosystem around the platform. The most interesting thing to me is not if Ghost or the Ghost Foundation as a company can do everything or perform every function. It’s, can we create a product with its own ecosystem of businesses and individuals around it who are able to make their own livings of working with it? One example of this is we don’t have any plans to compete in the mobile native application space at all. What we’re going to focus on is doing a really really good web experience. That will be responsive in the browser and work on mobile devices, but we’re not experts on iOS apps. We’re also not experts on Android apps. Alexis: But you are on BlackBerry apps? John: We’d love to be. We don’t have the resources and we certainly won’t for quite a long time to start building out individual themes for that. It’s more interesting for me to say, “Well. What if we say we’re going to focus on the web experience and here’s a really, really rock solid API for the products, and now allow that to be a third party developer ecosystem who makes those apps, and who can sell them, or who can make free versions, and have own little communities and business hubs revolving around Ghost?” I think that creates a stronger eventuality than if we tried to milk every possible bit of revenue out of every possible corner of how Ghost could operate. Alexis: Speaking of third parties that are kind of bringing Ghost into their own business models, you’ve had quite a few outfits like say, what was it – Digital Ocean that have done one-click Ghost installs, that kind of thing. Considering that you guys also have Ghost Pro, how do you differentiate yourselves between those kinds of solutions? John: That’s a great question. Yes. We actually help them make the on-click install. We manage the image for them. We’re pretty involved in helping them compete with us from some points of view. The differentiation I think is three-fold, really. It’s one part the brand. So the best hosting you get, arguably is from the people who made Ghost. They’re the one who know how it works. The second part is more the kind of karmic side of it, which is by supporting Ghost or by hosting with us; you’re contributing your money towards the future development of the open source product. If you host it with Digital Ocean or anywhere else, that money doesn’t come back to us in anyway, so it’s harder for us to keep going. The third part, which is really what is the backbone of it all and what we actually try and position as our differentiator, is the service, which is on Digital Ocean. You have a VPS, which is a barebones box that you have to figure out and manage. If it implodes or explodes, you have to fix it. With Ghost Pro, we have 24-hour support. Your service is configured to run Ghost and nothing but Ghost. Your installation’s done for you. Your upgrades are done for you. If anything breaks, then we fix it. In some ways you can say we are the same price as Digital Ocean, but we have less bandwidth. It depends what your hourly rate is because we can probably save you the equivalent of two years worth of hosting in configuration and setup, and upgrade, and maintenance time just by getting all the stuff done that you would normally have to do yourself. Alexis: Did you have to negotiate these deals proactively or did they kind of come to you? John: For Digital Ocean or…? Alexis: Yes. Digital Ocean and other providers. John: Most of them come to us and ask, “How can we run Ghost and what’s the best way?” Generally, we try and help them as much as possible creating one-click install images and shortcuts for getting started because ultimately regardless of how many people we do get on our Pro service, the ideal for Ghost is to make it as widely distributed and accessible as possible for everyone. If you want to run that on your own server, you should be able to and it should be easy even if it’s not with us. So we try to encourage it as much as possible. Alexis: Karmic reason to support Ghost, or to choose Ghost for hosting is to support its developers. I heard you on a podcast about a year ago or so and you mentioned that was kind of your view for sustainable open source. Are there any other projects out there that have kind of given you inspiration for that or that you’ve seen that are doing a good job with that? John: Not really, to be honest. This is kind of a crackpot idea that I came up with as I was putting together all the plans for Ghost. I thought, “Well, wouldn’t it be nice if the people who are kind of paying to use the services are the same people who are paying to improve the service?” It has this cycle that makes sense that isn’t burning out with easy money or that isn’t just going off into other corners of the world where you never see it again. It was just a slightly, perhaps a naïve idealistic view of how I would like open source to work. Now the challenge is to see if we can prove it as a business model. That’s going to be interesting. Alexis: Hey, it’s been working so far. You’re now a year out from the Kickstarter campaign where you raised £196,362. If you’re wondering, that’s $337,059.30 at the current exchange rate in US dollars. John: I like that you went down to the cents part. Alexis: Of course, I mean more impact because $0.30 could be the difference between a feature. Who knows? Alexis: Is there anything you would’ve done differently during the Kickstarter campaign? John: God. That’s a good question. The Kickstarter campaign was intense. It was a roller coaster. It was the kind of campaign you dream about and hope will happen, but you are still not ready for it when it actually does happen. The influx of messages, and demands, and questions, and media attention and other stuff was really intense. After it was all finished, I was in bed, sick for like a week and half. I just probably slept two hours for the whole month. It took it out of me. I think if I could go back and change anything knowing what I know now, it’d probably be my preparation. I’d maybe have two or three people just to help me answering all the questions and emails and managing the campaign. But overall, in terms of positioning the campaign and how we eventually ended up marketing it, now I’m pretty happy. Pretty happy with how it all worked out. John: Right. I think this is the classic mirage that’s kind of five, ten years to overnight success. What it looks like from an outside perspective is someone put together a little three minute video and a couple of images on a Kickstarter campaign page. And suddenly, they have massive success. That’s not actually what happened. What you see consistently when you look behind the scenes of every Kickstarter project that has had a high-level of funding is you see a couple of individuals or an entire team or a company, which has five to ten years experience, which maybe has prior investment, which maybe has a proven business model, but always has a track record and a network of existing contacts in the industry that they are entering into, so there’s this whole big long backstory that exists, but that isn’t obvious from the campaign page. From my point of view, it was I had a huge network of contacts, and friends, and colleagues in the WordPress industry and community, as well as the web design industry and community. I’d built up that reputation and that experience over the course of many, many years. It was utilizing that which allowed me to get the Kickstarter campaign in front of a lot of eyeballs, initially. That’s step one and you see where it goes from there. Alexis: In the world of crowd funding, there are a whole bunch of range of different projects. There are physical projects which are it can be anything from wallets to skates that can make you go 12 miles an hour that you put on your feet, which is one of the weirdest ones I’ve seen this month. When it comes to software, it’s not a tangible product. Were there any twists in running the campaign or afterwards that maybe you didn’t expect, or you did expect, that only exists with software? John: Bugs, but that exists in everything, I guess. No, I think software probably had more advantages than disadvantages. One thing I did very very consciously was to omit any concept of a physical reward for backing the project. So we had no option for t-shirts or postcards or anything like that because I’ve just seen too many times how that eats up resources and you spend a year and a half fulfilling on shipping, and buying envelopes, and writing labels. Rather than doing what you’re supposed to be doing, which was actually making the project that you promised people. So I want very much for the only thing more reward people with must be delivered digitally. Ultimately, I think that made it easier rather than harder. Alexis: Okay. So the folks at Ghost are a completely remote team, right? Alexis: So where are you currently? John: Right now. I am in Egypt. On the East coast, just overlooking the Red Sea. Alexis: Oh man. We can trade, if you want. John: I don’t know. It’s about 42 degrees here everyday. That’s about 110 in Fahrenheit. Alexis: Oh man. Okay. Never mind. You can keep it. John: Yes. It does. It’s dry in August. It’s pretty intense. Alexis: So why a remote team? John: To be honest, we never really considered anything different. Even before Ghost, I’ve traveled almost my whole life. I think I haven’t lived anywhere for longer than 18 months and above, eight years at this point. I’ve always had developers, friends and colleagues, including one contributing to WordPress and one not all over the world in different countries. That’s how I’ve always done my work. So I’ve never had an office for a very very long time. I wouldn’t really consider one at this point, but I think you can find the best people to work with. They can be based anywhere. Whether or not you sit beside them in a chair isn’t that relevant these days given the amount of tools we have for communication and collaboration. It was pretty natural for us. Alexis: Speaking of those collaboration tools, how do you manage a remote team? How do you work together across time zones? John: Right. Basically, our office is Slack. I don’t know if you’ve seen Slack? John: I think slackhq.com, which is like a virtual office. It’s like everyone’s sitting in a room together anyway and we have everything coming into there. So all our status updates, notifications. Everything pops into this one channel. All our group chat is in there. Sorry, three in the UK, two in Europe, and me in Africa is the same time zone as Europe, and then we have one in the US. So she’s I think six hours behind me. At the moment, we’re small enough. We’re five people. We don’t have to plan it that much. Everyone just kind of has a big overlap at some point during the day and it works. I’m sure as the team gets bigger, we’ll need some more useful tools for figuring out where everyone is and when they’re online. Alexis: All right. So you guys are established. What’s next? John: What’s next? Iterating. Making everything better. I think what Ghost looks like right now is, we call it version zero point four, and it really is about 40% of the initial base-line vision that was laid out in the Kickstarter campaign. It’s less than half of the beginning. We’re getting ready for version zero point five in a couple of weeks actually. What’s next is to get to just that first stage where we can say this is what we’ve accomplished and that is what we said it would be in the Kickstarter. That involves having the dashboard with all its metrics and graphics showing you how much traffic you’re getting. That kind of stuff. Having some of the more basic tools in place that we don’t have yet. For example, search, multi-user support, type management. Some of the things that you would kind of expect from a blogging platform, but we just haven’t been able to get in there yet. After that, who knows? The sky’s the limit. Alexis: Going back a little bit to the resurgence or the renaissance of blogging that you’re seeing. What do you think’s missing in this space? Is there room to innovate? What should be done? John: Oh god. I think there’s so much missing. It’s incredible. If you go and look at the systems that most major newspapers are using or major magazines, maybe real-world media publications. There’s a couple that are using WordPress, but there’s really not that many. There are an overwhelming majority of them are using these hacked-together things that look like they’re from 1997, have 750-input fields and this is how journalists are expected to work. They usually start the production process – for one newspaper I was visiting, starts in Adobe InDesign. It goes up through an XML feed to three different departments, one for print, one for mobile, one for web. Then it goes back into a different web system. Goes out to a second set of sub-editors who work on images and headlines. Then it goes out to individual APIs. And then it goes off somewhere else to actually be put into its correct place and aligned with advertisers and so on. So they have these massive monstrous legacy systems, which are horrific. What they end up doing, the actual writing process, most commonly boils down to writers starting in Google Docs because it’s the easiest way to write something and have people edit it and add comments on it. John: And then emailing each other. So if that’s the baseline of what modern journalism looks like, then I think there must be a massive amount of opportunity to do something which can really improve on that and give online journalists and writers tools to do a better job. I think in terms of what’s missing in the space, I might be biased, but I think Ghost is it. I think what’s missing is tools to build an online publication which you own yourself, which you self host. It’s not owned by a startup, which is going to sell out to Google or Facebook, but which you own yourself. You have the rights too. You have the copyright too that you can control or that you can hack if you wanted, that you can extend, that you can really use to build up your own platform. That’s where I hope Ghost can go. Alexis: I’ve got a bit of a surprise question for you. Julian Lam, co-founder of forum software outfit, NodeBB, is going to be my interview for next week. I mentioned that I was interviewing you this week and he has a question for you. Alexis: Are you ready? Are you bracing yourself? John: That’s a very funny question. It’s like Jeff Atwood, who is one of our first big name bloggers to convert to Ghost, said the same thing because bizarrely, he makes Ruby on Rails forum software. He had the same question. It’s funny how these guys have questions. Now the honest answer is we needed to build out the ghost.org community website, which is massive. I think what people don’t realize is that we have I think six public repositories and like 19 private repositories. The 19 private repositories have about three times as much code as the public ones. John: People look at a small team of five people. They think, “Well why can’t you build this little publishin platform quicker?” What you don’t realize is we’re also building effectively a social network on the back end, which has more than 200,000 registered users now. With an entire billing platform, with an entire hosted infrastructure and platform, all of which needs to tied together and functions somehow and it’s the very same team building that side of things that is also building the open source project. So we’re spread pretty thin. So to help with that, we got a couple of our friends at a company called aTech Media where a Ruby on Rails development shop to help us out building the ghost.org website application back end user-owned billing system side of things. Initially, because it was on Rails, we tried to use Discourse. Discourse is kind of really cool if you want to build a website which is only a forum because it’s so comprehensive. It has everything built in, but we kind of had built our own thing. The only thing we wanted was a message board. We already have our own user system, our own profiles, and we kind of didn’t need 80% of what Discourse had. So we hacked together something super lightweight in the space of 24 hours because we tried to integrate Discourse and then we scrapped it. We tried to integrate phpBB then we scrapped it because they were both so messy to integrate with our stuff. 24 hours before launch, we’re like, “Okay. Let’s just build our own.” That’s a very longwinded answer; a longwinded way of saying it was just to get something out the door. Alexis: See Julian, you got your answer. Alexis: Now I have to wonder. You guys are working on those 19 private repositories. Is there any interest in open sourcing some of the components that you are running behind the scenes? John: Definitely. Yes. I think there’s a lot of bits of it that we can open source individually. They can be of use to people. I think the forum is one great example of that. At the moment, it’s so hacked together it’s probably not useful to anyone. I think there’s a lot more that we want to and that we will open source at the theme for blog.ghost.org is another example of that. We actually sent that source code to a couple of people just because they vouched for it. There’s some things that we’re always going to keep closed just to have our own value propositions to make it worthwhile for people to test out our Pro platform. For anything, which we can open up and there’s no reason to keep closed, I think we’re going to consistently look for ways to do that. We have a company culture document, the leading mantra, if you will, for which is the question is why should it be closed, not why should it be open? So everyone should default to being shared and transparent and open to start with. We should have to find a reason to keep it closed, rather than find a reason to make it open source. So that’s the kind of guiding principle for what we’re doing. We’re going to try and follow that as much as possible. Alexis: You don’t have answer for now, you could send me an email later, but do you have any questions for Julian? John: I think I’m going to send Julian an email later because now I’ve got to come up with some good ones. Wait. Does he have a blog? Why isn’t it on Ghost? It probably is. John: I’m going to have to find out. Alexis: Yes, and if it is on Ghost, I’ll send you an email. We can come up with a real zinger. Alexis: One last thing that I should note is that John wasn’t familiar with Node.js for a long time. He studied it and then he decided to build Ghost on it. You didn’t have a huge background in Node.js, right? John: Absolutely not. No. To be honest, I still don’t. I’ve been very fortunate to build out a team, which has incredible experience that my specialization and all of my experience and work is on the front-end side and on the design side. I have a reasonably good understanding of how the back end of various platforms works. That all of the credit for the work and most definitely has to go to my co-founder, Hannah Wolfe, who’s the real brains behind the operation from an infrastructure and development point of view. It was a natural progression. I’m going to note that we’re kind of looking around all the different ways we could build it and what it could be built on. I won’t go to the whole story now because there’s a couple of posts, which kind of cover it off better than I can do now, which maybe I can give you the links too for the show notes. It was a natural progression. Probably, a decision I’m most happy with. All the early decisions, which we weren’t sure about, I think that one has proven to be and will continue to prove it to be one of the most important defining factors of Ghost as an early application and platform on top of Node. Alexis: Man. You’re handing me another question right there. What are one of the early decisions you’re not happy about? John: Building the entire core ghost.org website and everything on Ruby. It was a blessing and curse. A blessing because friends at aTech Media helped us out for next to no money, and were very generous with their development time and helped us get something up and running very quickly, and a curse because we now have a bit big system that’s very hard to iterate on. We’re going to have to do a lot of work to reshuffle that now, but you live and learn. Alexis: Yes. So if folks want to learn more about Ghost, where should they go? John: I should just point out that there’s nothing wrong with Ruby. That the issue we have is a split between having one team in two languages. That was the mistake. Don’t want to have any no-this-is-better-than-Ruby haters happening now. John: Yes. Exactly. Where should we go to learn about Ghost? Check out ghost.org. We’ve got a great blog on blog.ghost.org, which has some good content about blogging if you’re looking to setup a blog, either for your open source project or your startup. You can see a little bit more about the story of Ghost and how it got started. I’ve written a four or five-part series on that on my site, which is john.onolan.org. If anyone is running an open source project say, not for profits, government or education-based organization, send me an email john@ghost.org and we’ll always set you up with a Pro-hosting account for free. John: To give back a little bit of love. John O’Nolan on Twitter. Probably this is where you drop some links in your show notes somewhere else that people can click. Alexis: Absolutely. Well, and if you would like to keep an eye on our Twitter feed and find out when a new episode is out, you can follow us on Twitter @Binpress, and you can follow myself @alexissantos. Thanks again, John for coming on the show. Alexis: Not a problem. For the listeners, we’ll see you next week!